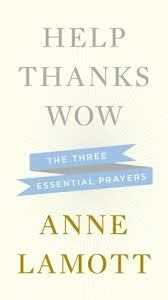 a book chick: "Help Thanks Wow"
my take: Anne Lamott is my soul-sister twin born from another mother. In her latest work she gives the shortcut words to her prayer life: help, thanks, and wow. It's a very small book that deserves more than one reading. I initially read it with an eye to my ladies in addiction recovery ... anne is a recovering alcoholic and that can speak to my ladies in ways other authors can not. What i discovered, though, of course, are gems of wisdom for myself. Anne writes in a raw and real way. Vulnerable is the hallmark of an Anne Lamott nonfiction work. some may say self-focused ... but I think she believes what she learns of God, truth, love, justice, peace, wonder, neediness, and gratitude she is bound to share with others. my source: Facebook notifications - I'm friends with anne. Although my 17 year-old would say I'm just a follower. Not so. my verdict: Great read on prayer and life. Yes, read!